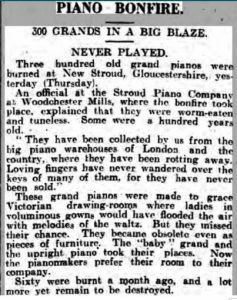 By the early 1900s pianos were very popular. 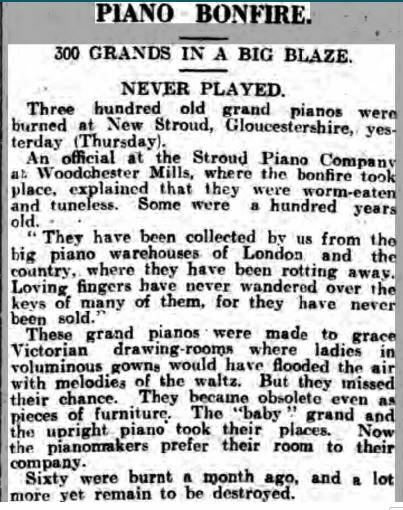 Upright pianos had become more attainable and they were found in the homes of many, not just the rich. 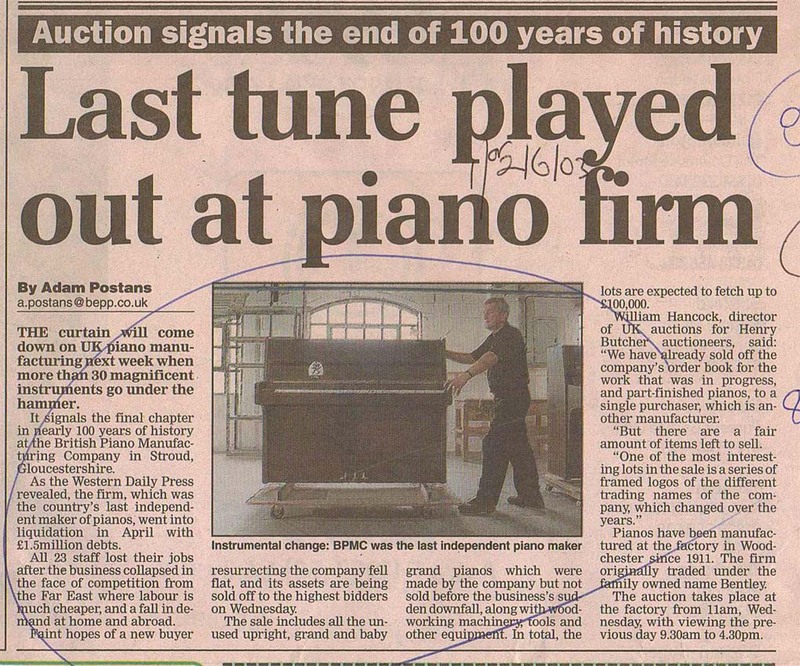 It was the best time for piano manufacturers. 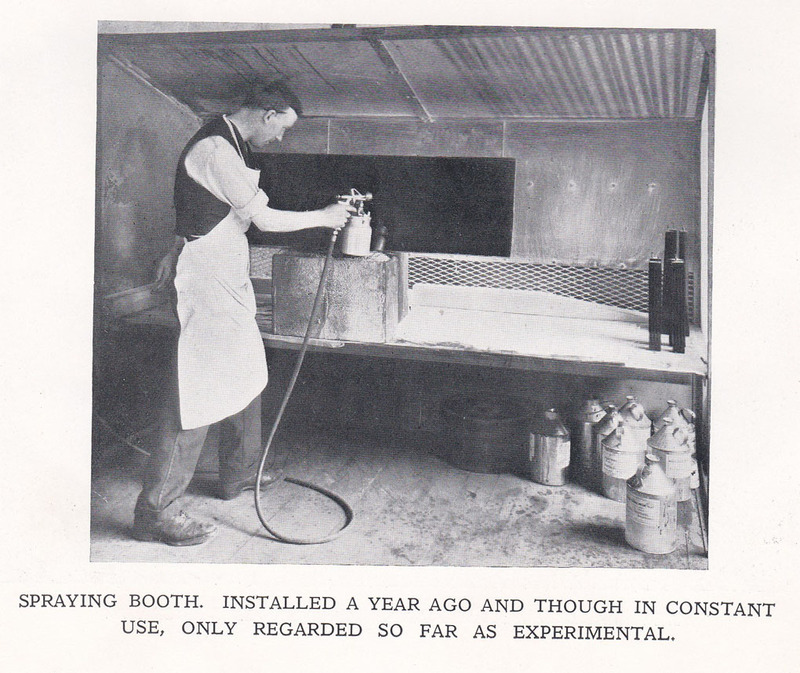 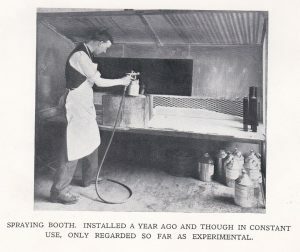 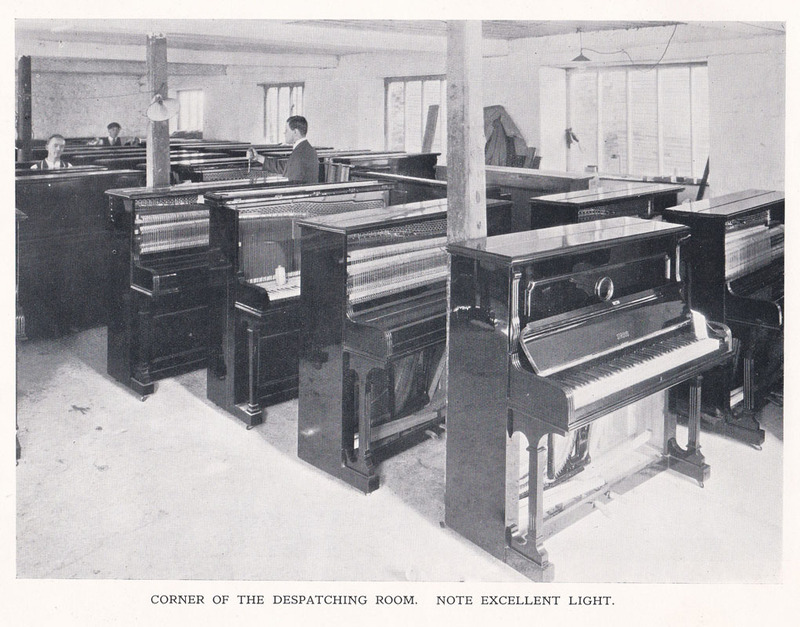 Douglas Grover trained in his father and grandfather’s piano factory in London, founded in 1830. 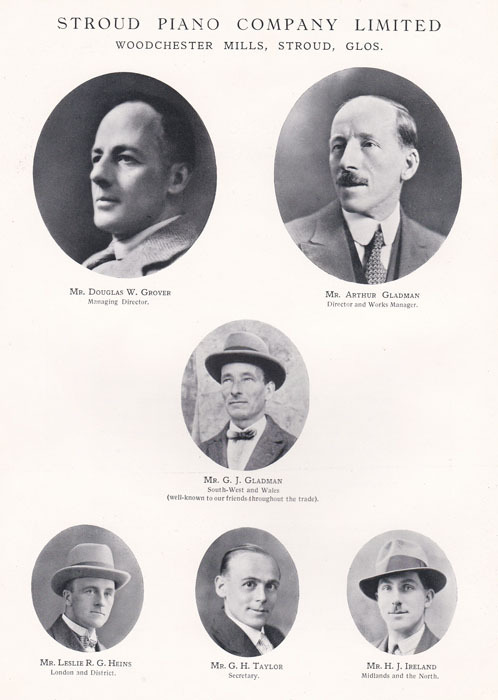 1906 – Douglas Grover and George Gladman started their own firm in London. 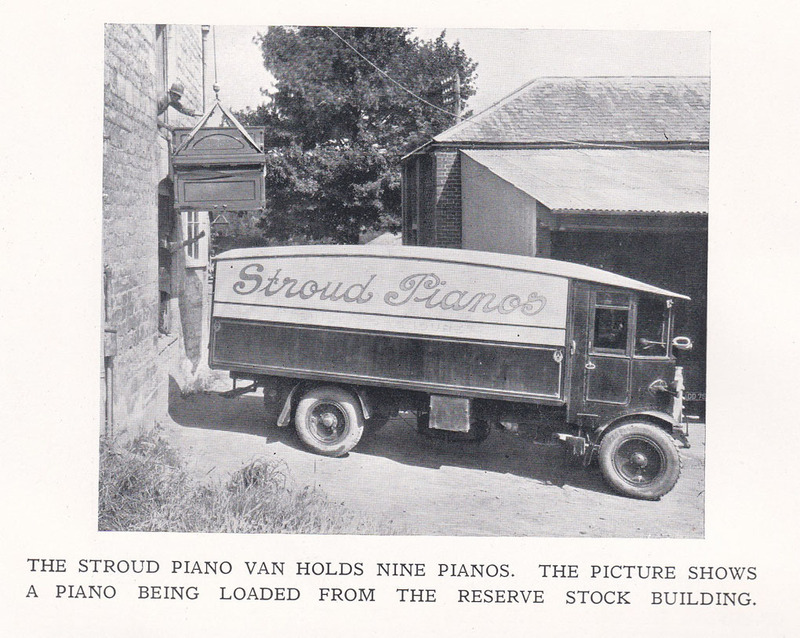 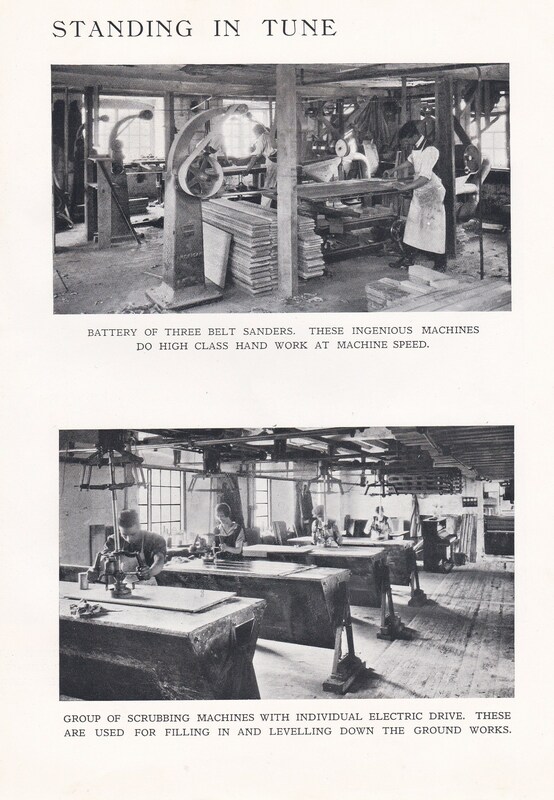 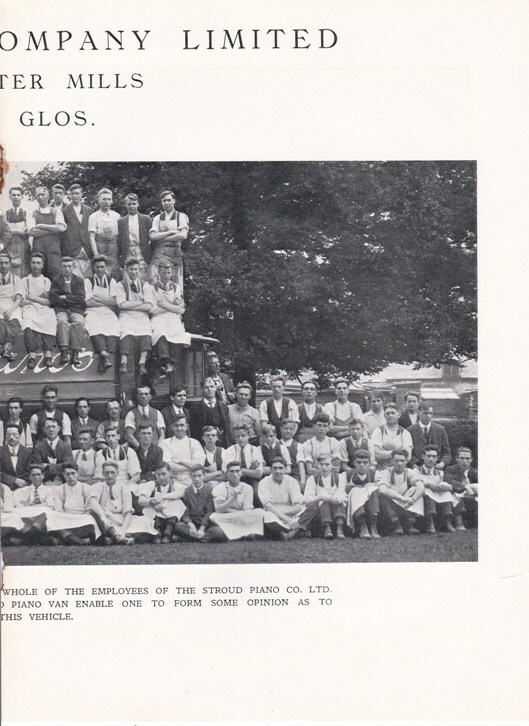 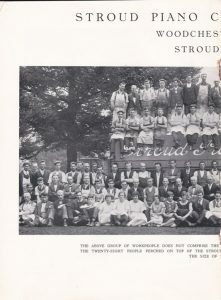 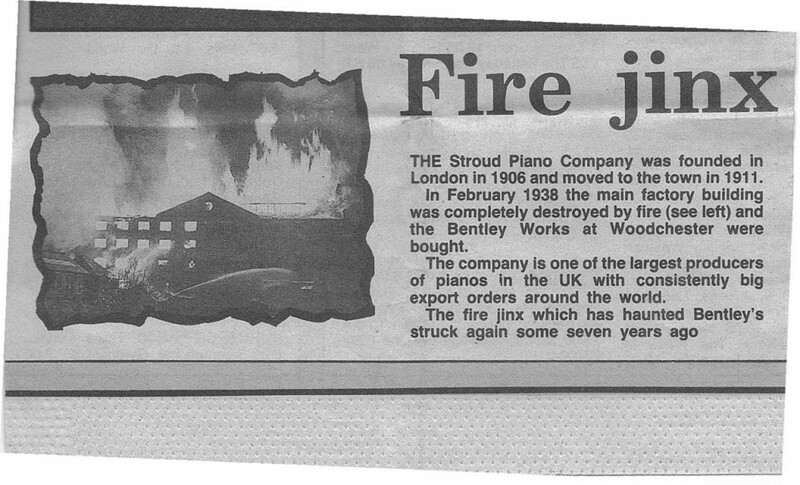 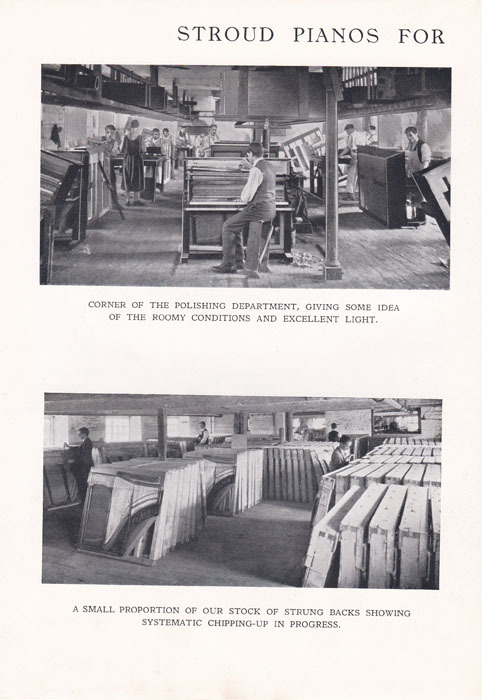 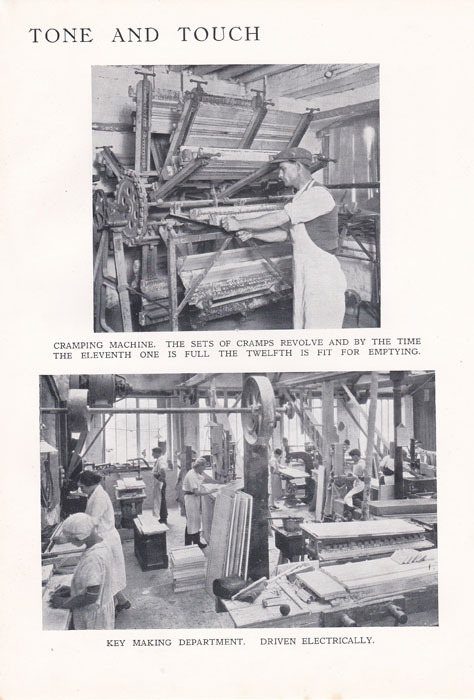 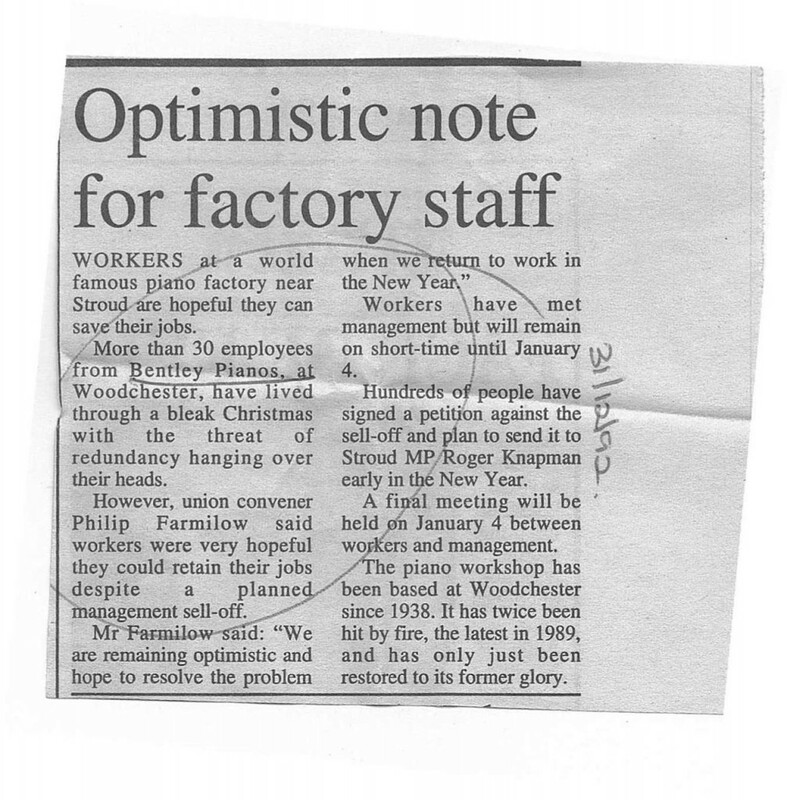 1911 – They moved to Stroud and rented Woodchester Mills as Stroud Pianos. 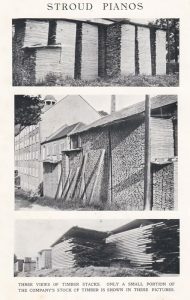 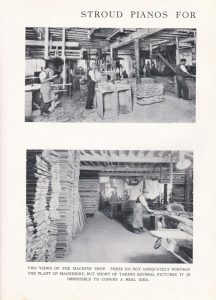 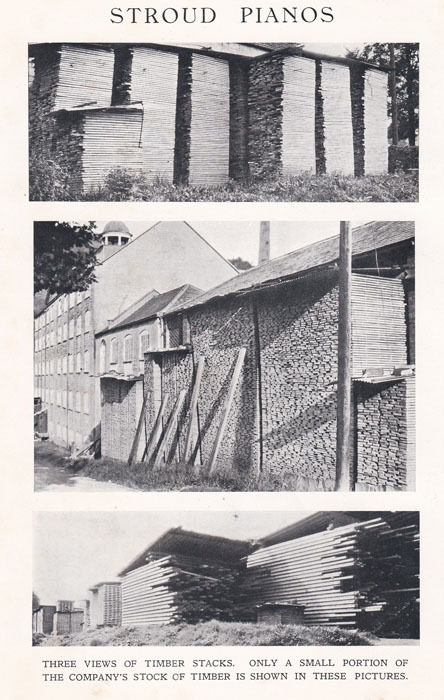 The five story building had been built in 1804 for the woollen industry, but by 1901 was a saw mill. 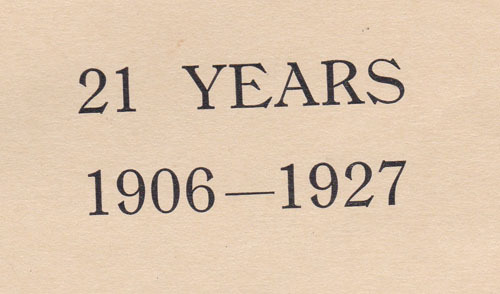 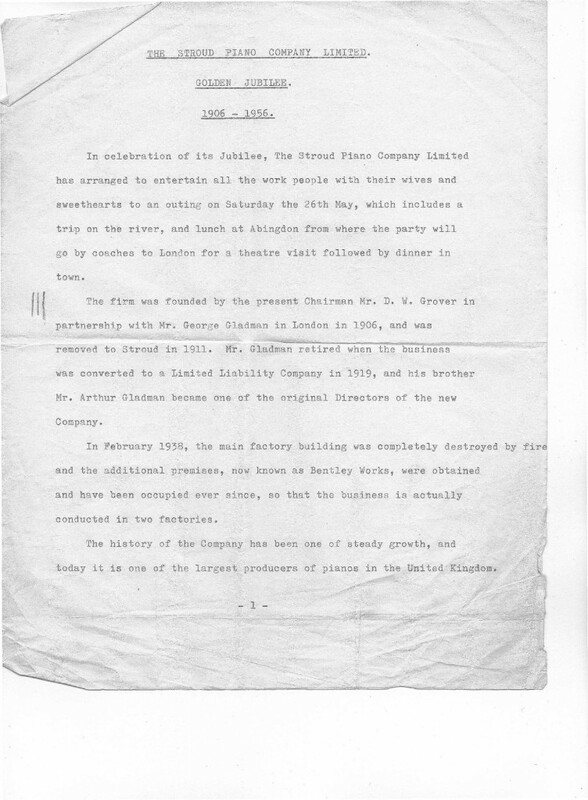 1919 – Became a Limited Liability Company. Mr George Gladman retired and his brother Arthur Gladman became a Director. 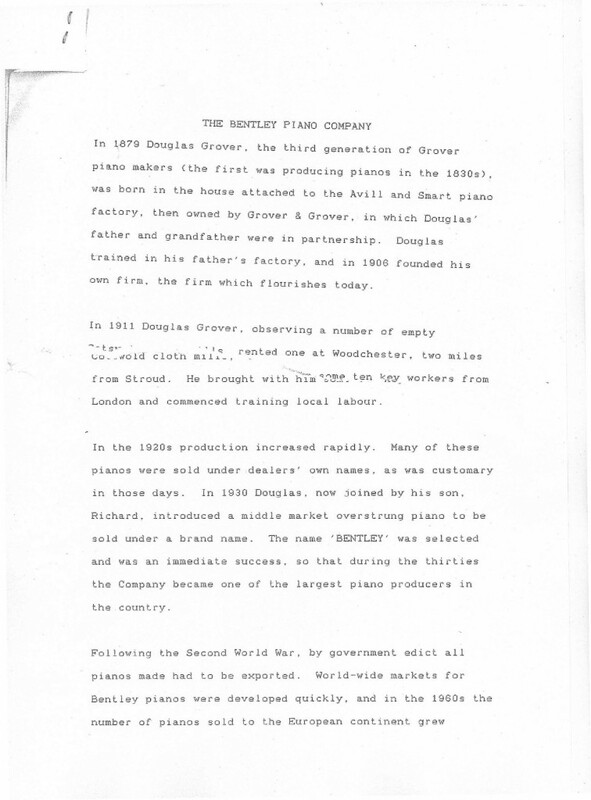 1930 – Douglas and his son Richard introduced a middle market piano with the name Bentley, which was later adopted as the name of the company. 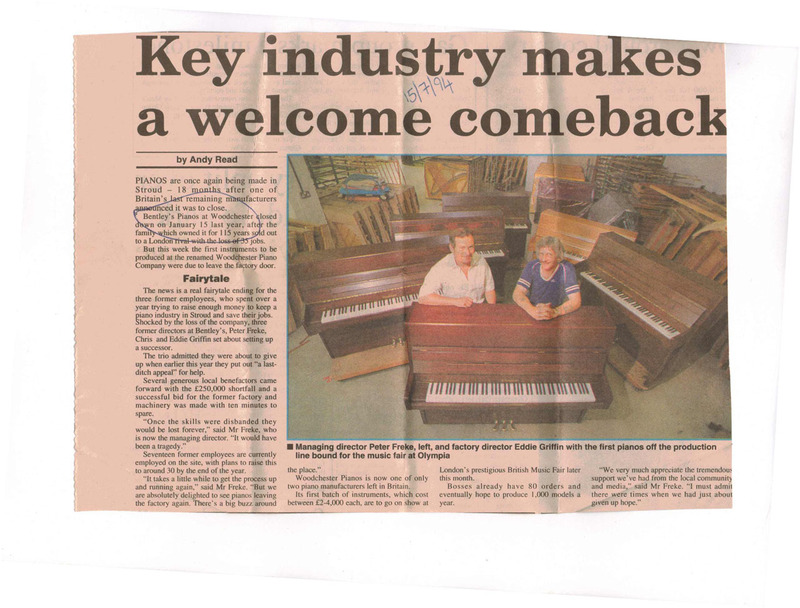 They became one of the largest piano producers in the country. 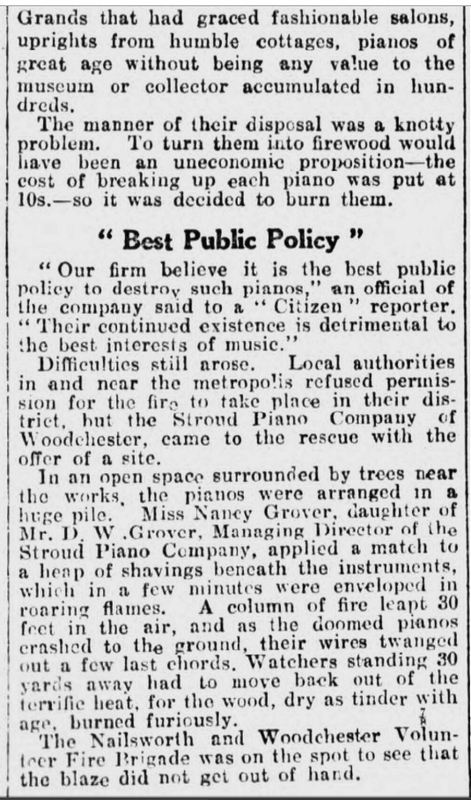 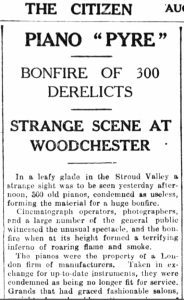 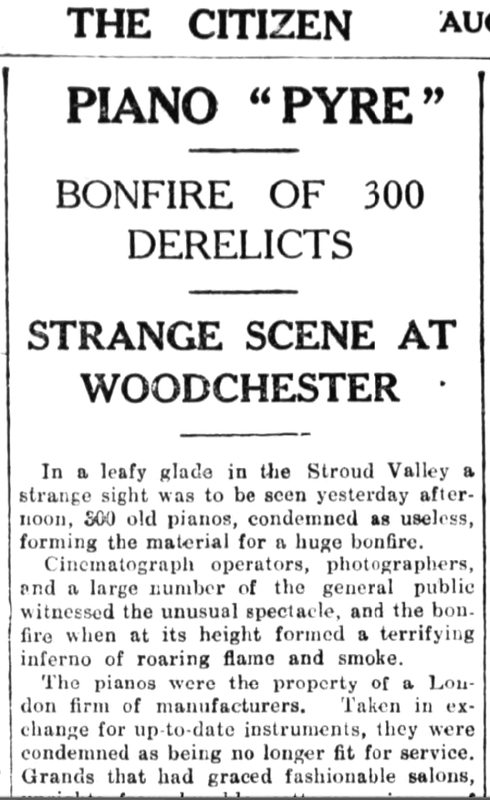 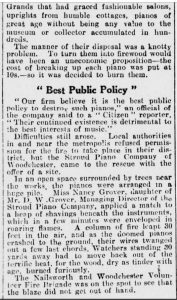 1931 – 300 obsolete grand pianos were burned in a huge bonfire in Woodchester – they could not be burned in London. 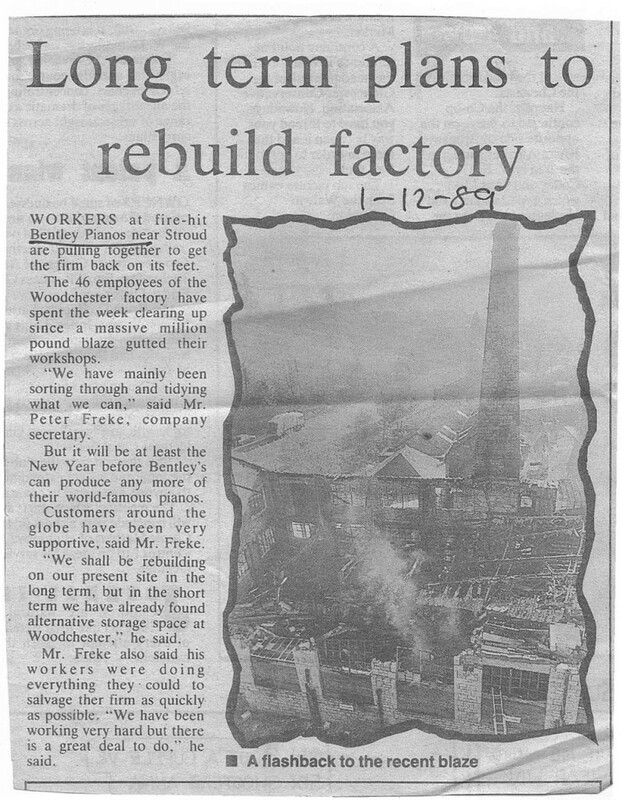 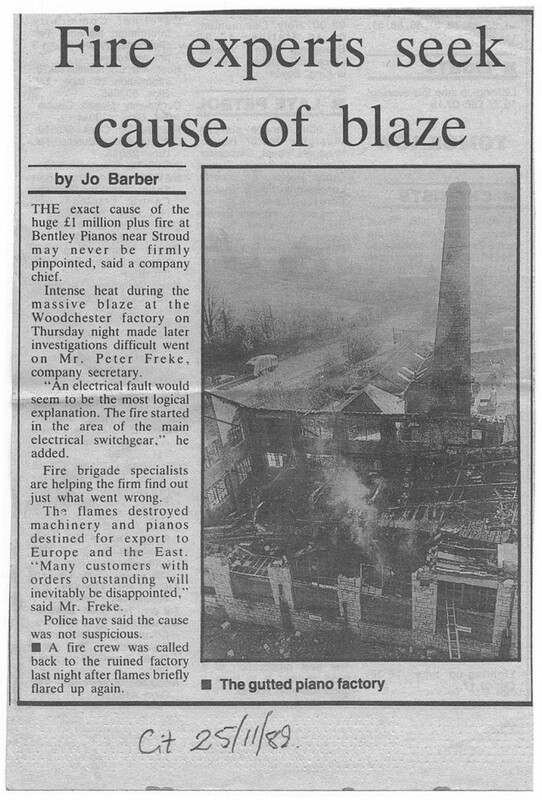 1938 – Main factory destroyed by fire. 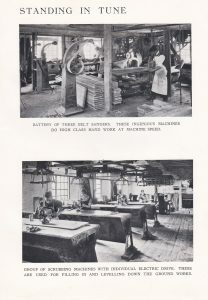 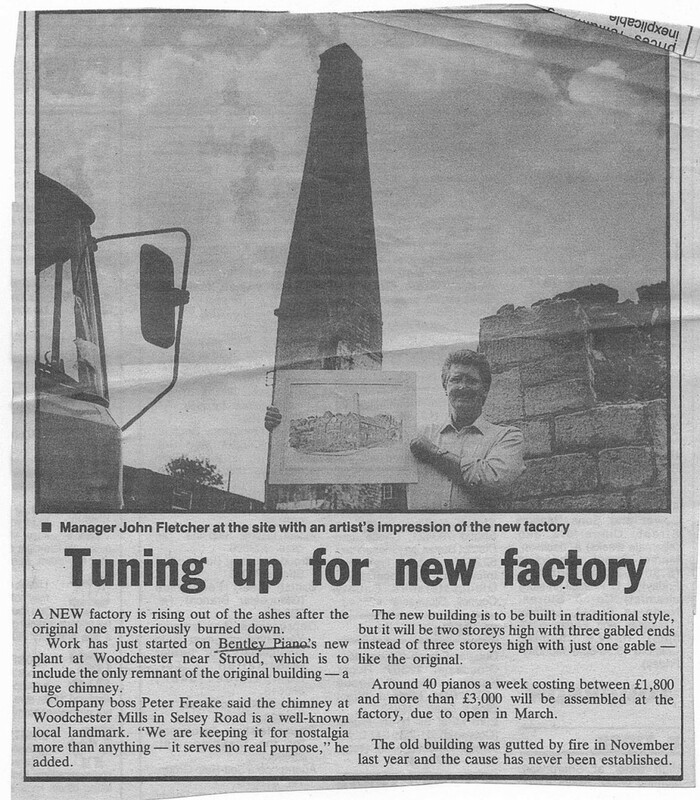 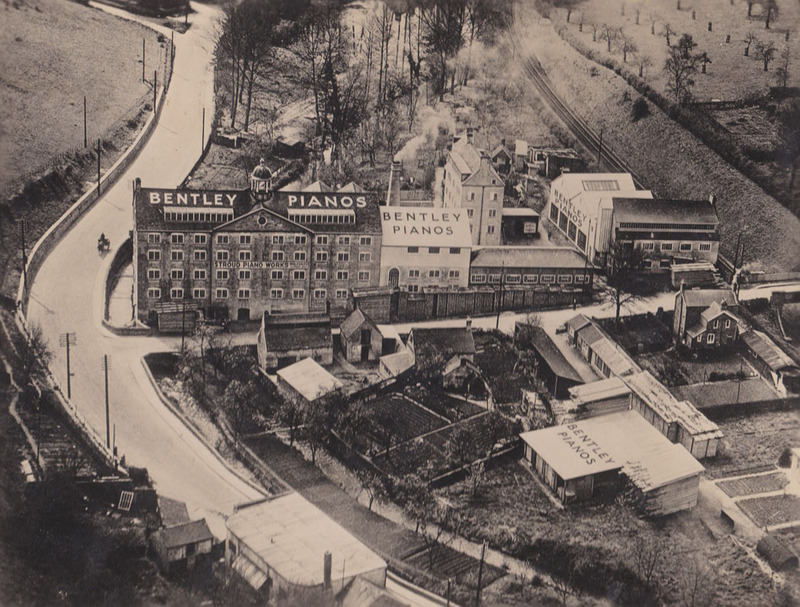 Addition of Bentley Works (east of Southfield Mill). 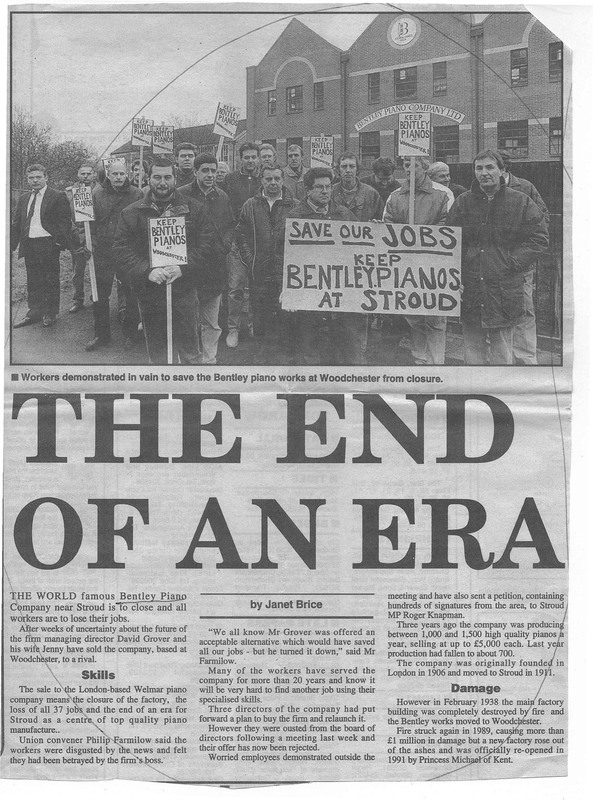 Gladman retired. 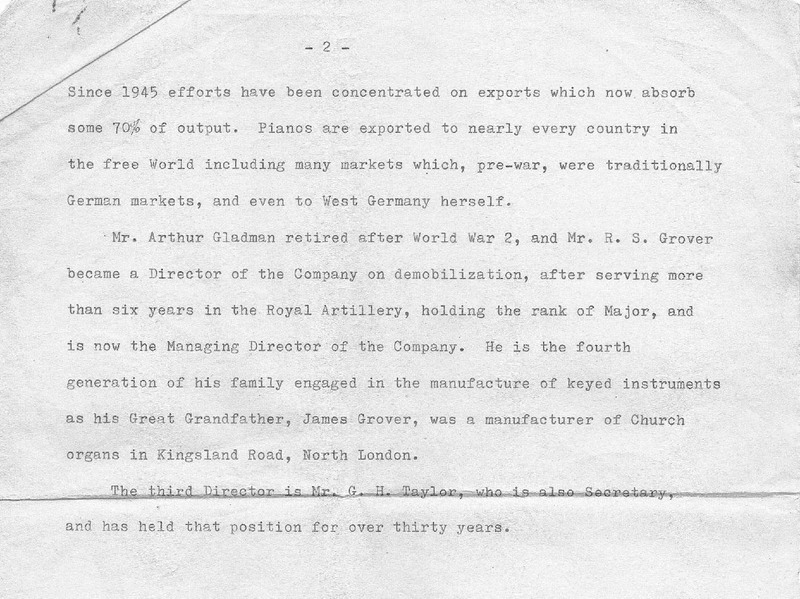 Major Richard Grover became Managing Director. 1956 – It was one of the largest producers of pianos in UK. 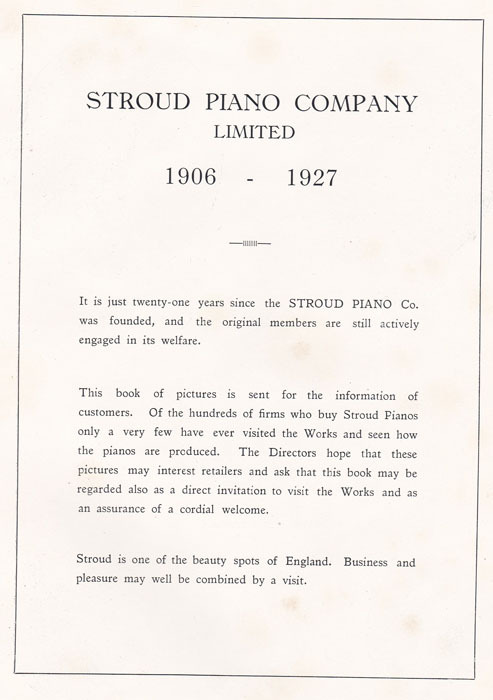 70% of pianos were exported. 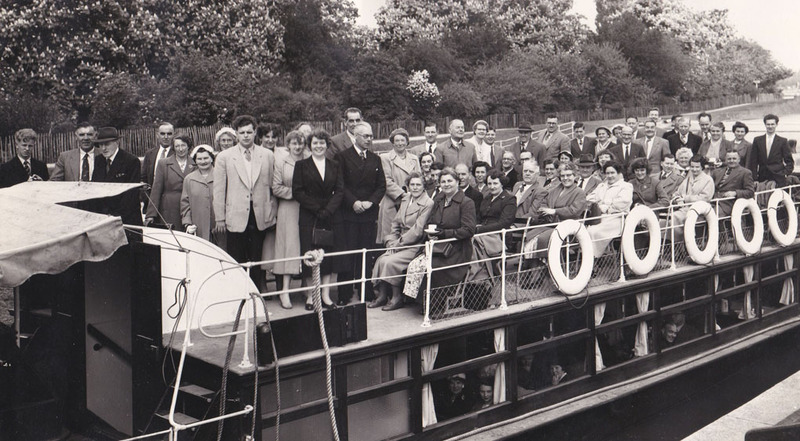 They celebrated 50 years in business by taking all work people, wives and sweethearts for a trip on the Thames, with lunch at Abingdon, then by coach to London for a visit to the theatre and dinner. 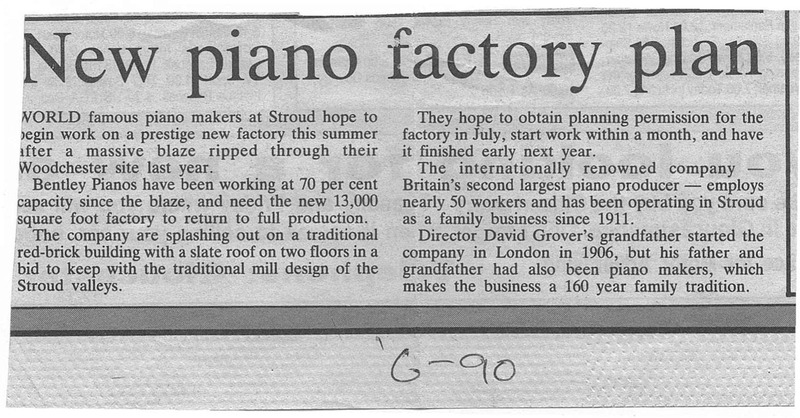 1962 – Richard’s son David joined the company – the 5th generation of piano manufacturers. 1969 – Richard Grover awarded MBE for services to exports. 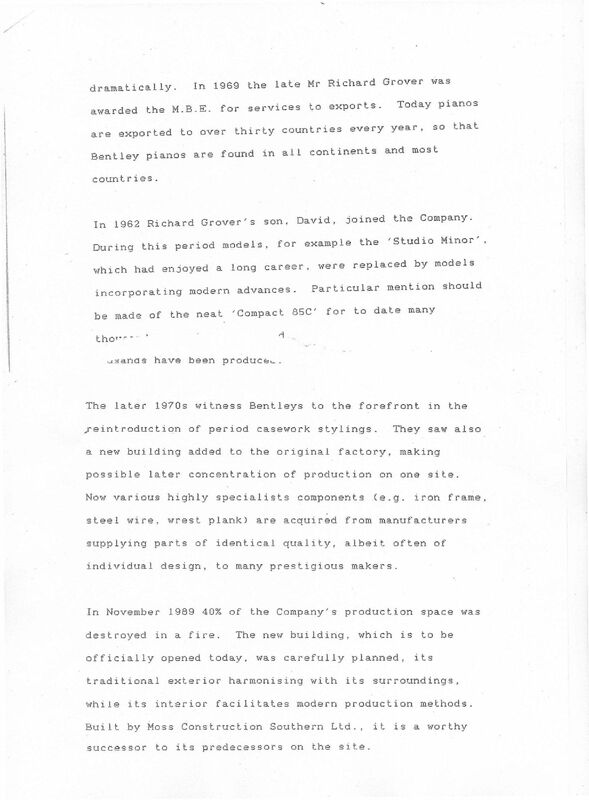 1970s – Growth in foreign manufacturers and electronic keyboards. 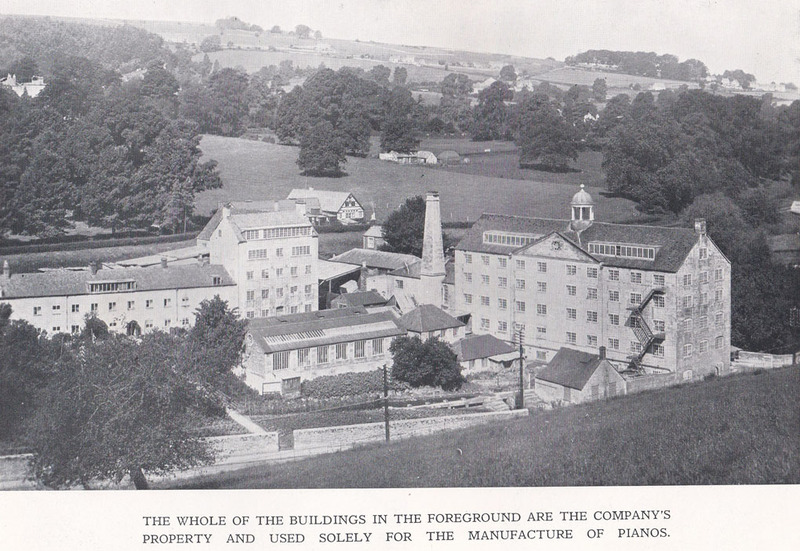 1979 – New building added. 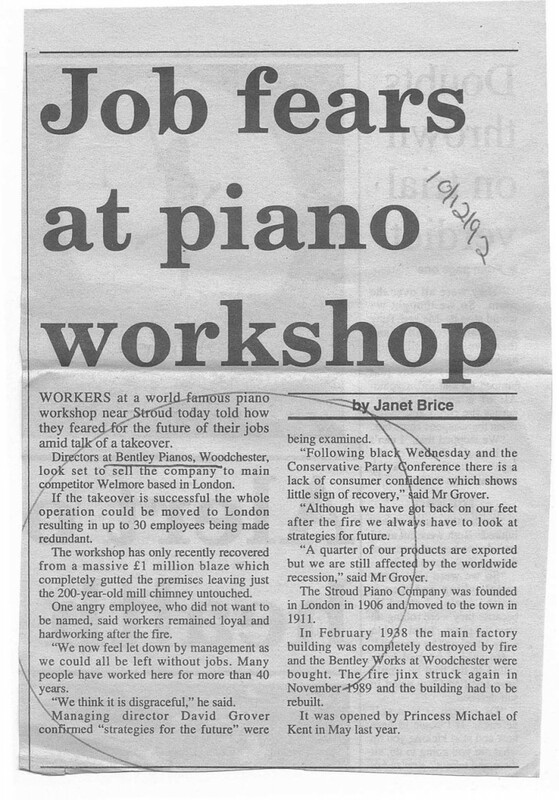 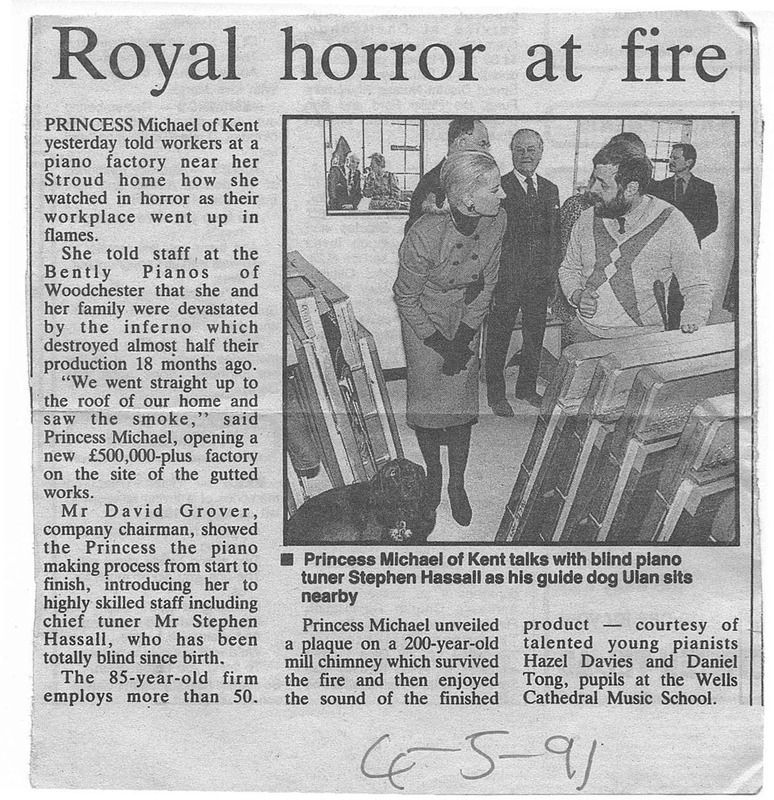 1989 – Britain’s 2nd largest piano manufacturer. 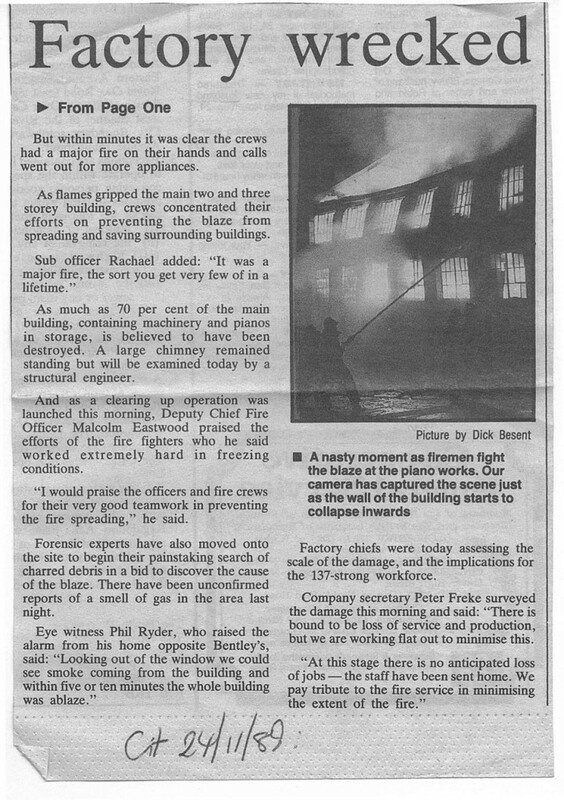 40% of production space lost in another factory fire. 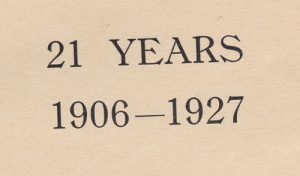 1991 – 85th anniversary. New building opened. Pianos exported to over 30 countries each year. 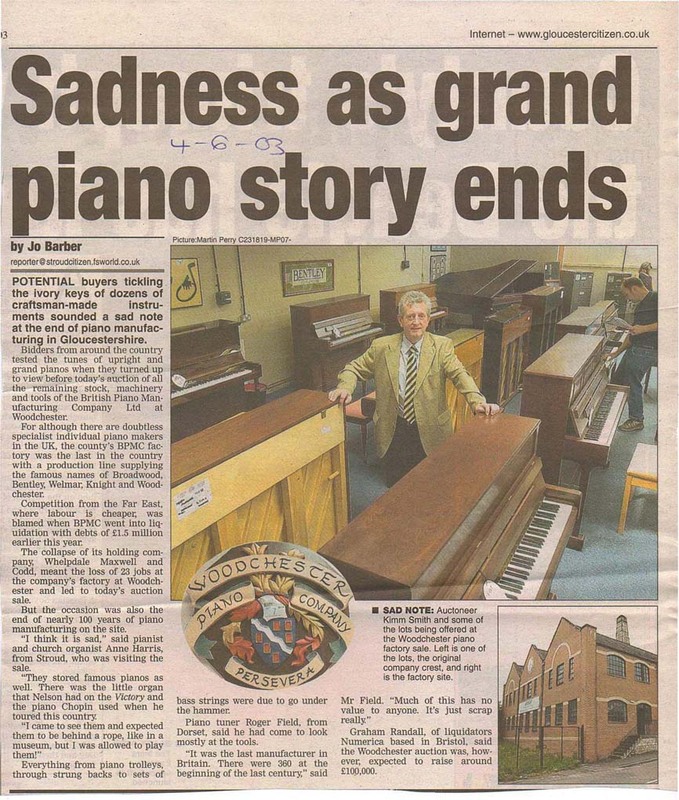 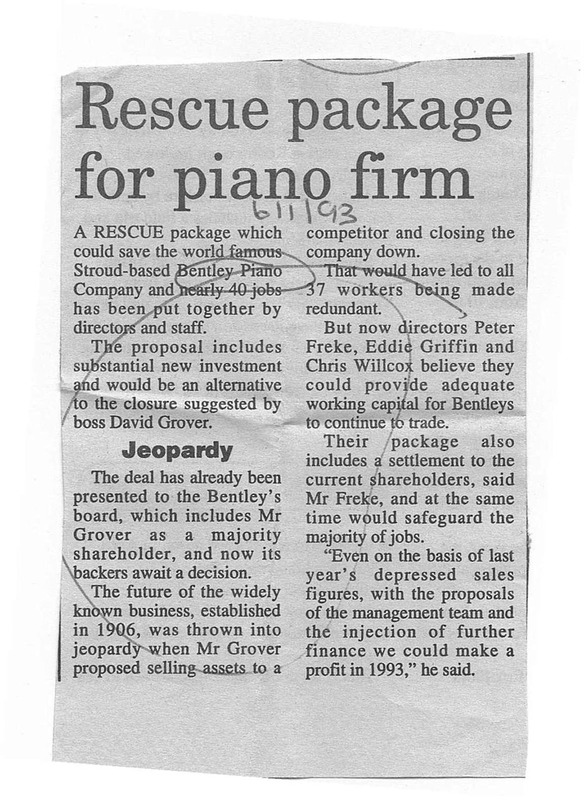 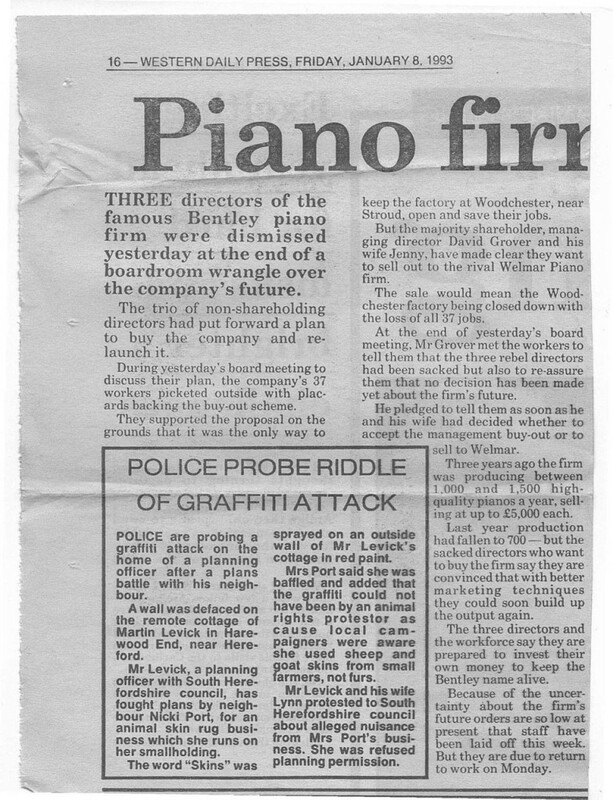 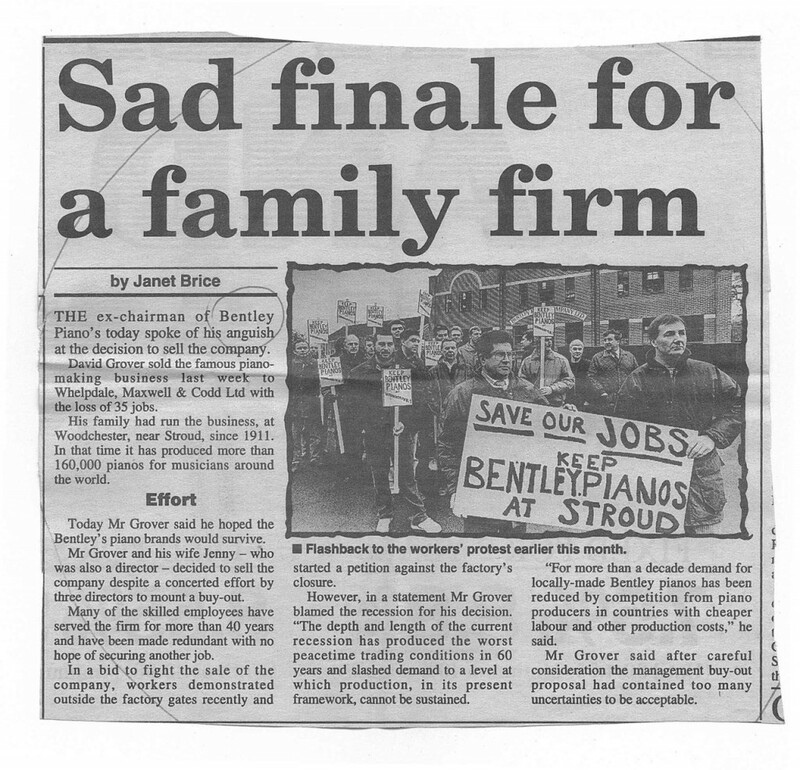 1993 – Bentley Piano Co sold and moved – due to recession and foreign competition. 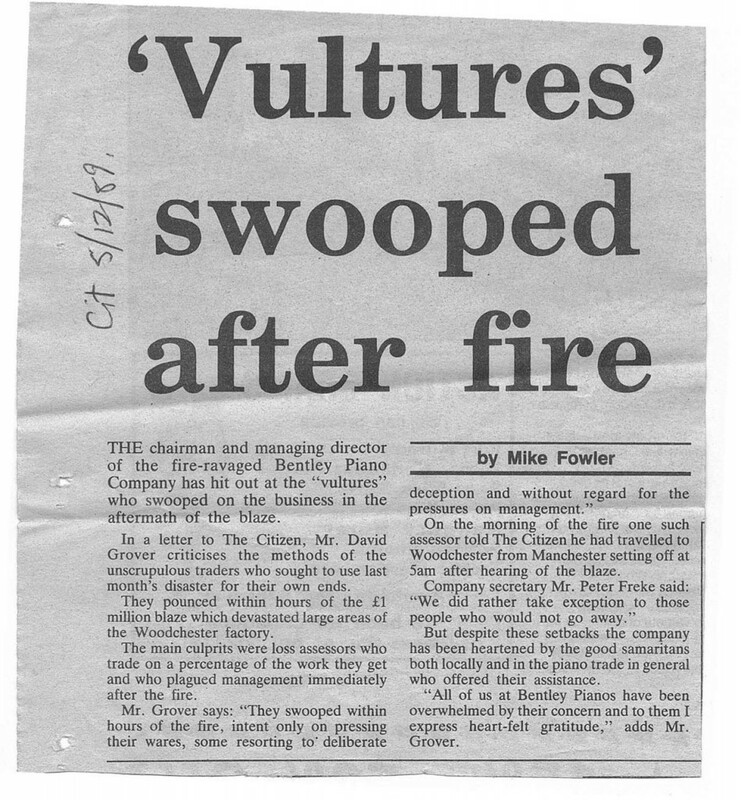 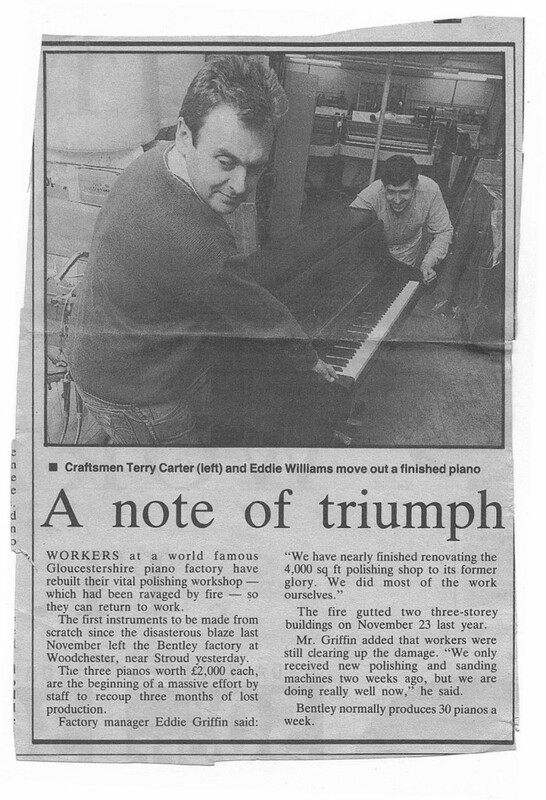 1994 – Woodchester Pianos formed. 1997 – Award for best upright piano. 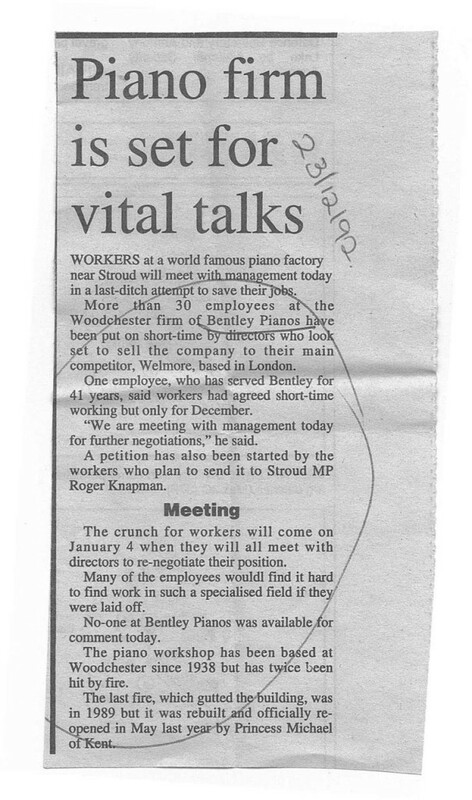 2001 – British Piano Co took over and Bentley Pianos were made here again. 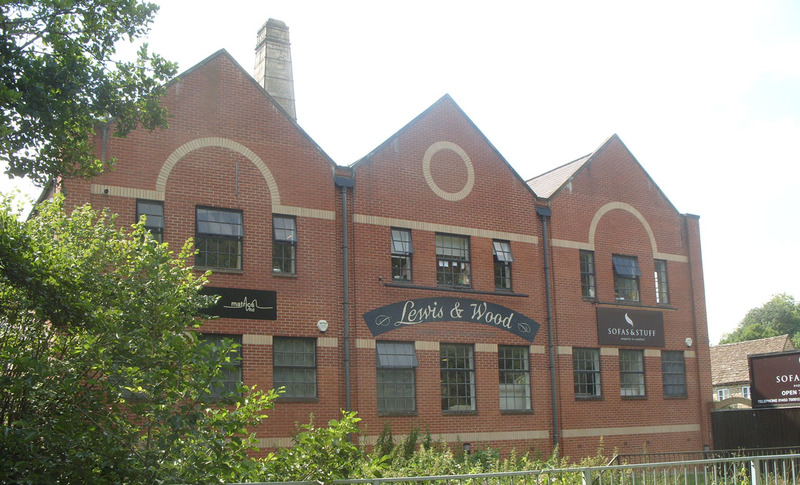 2003 – Closed – due to fall in demand and foreign competition. 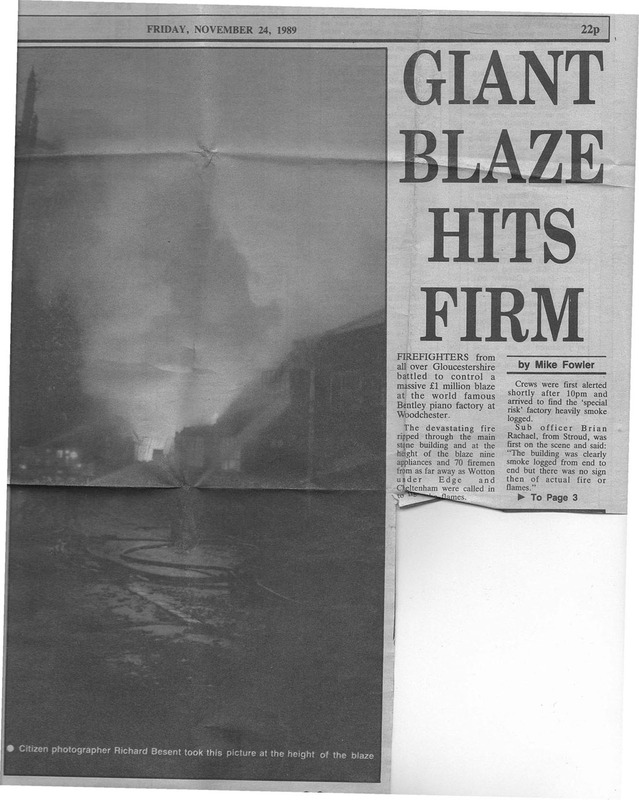 It is earlier than 1938 when the 5 storey building had a fire.